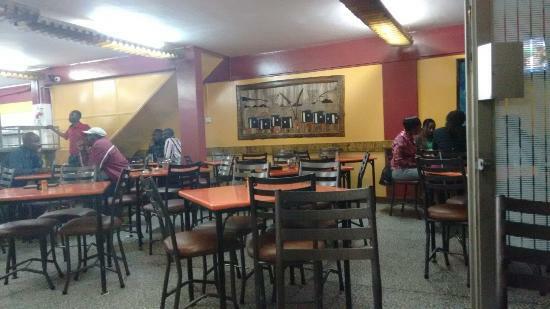 There aren't enough food, service, value or atmosphere ratings for Hot Dishes restaurant (BruceHouse Branch), Kenya yet. Be one of the first to write a review! The place looks bit old inside and the prices are affordable. Popular with local people and the food quantities are a plenty. Staff assisted us with the food choices. Delicious vegetables and sizzling chicken dish. Also, the mango juice was delicious! The pricing for food compared to the area was very reasonable. Thank you for visiting us. We hope to see you soon again! This is an abating restaurant that is good for pocket friendly meals and they have very good services too. A good place for a bite of the not fast food junk for a person on the move. nothing to write home about. but the staff there are polite. It's a place where locals eat, that's always a good sign. It's cheap, tasty and portions are big and tasty. Nothing fancy, really. Adored the vegetable soup that arrived with our main dishes, it was plain but delicious. Budget and simple option for cbd. Amazing. We order for lunch all the time..try the fish! Fillet or whole fish you can't go wrong. I personally love the chapatti. Great value and everything I've tried on the menu so far has been very good. And you can't beat the value! Get quick answers from Hot Dishes restaurant (BruceHouse Branch) staff and past visitors.